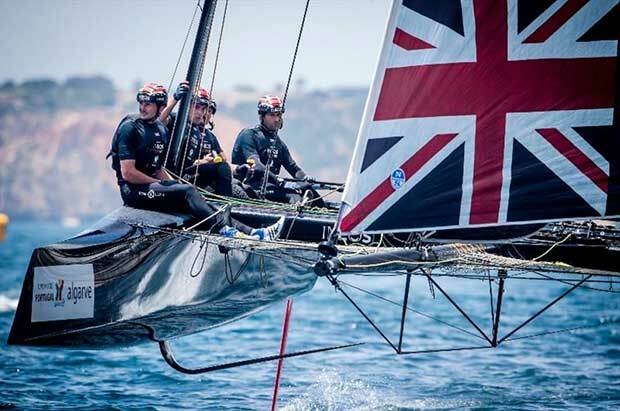 Five time Olympic medallist, four time Olympic champion Ben Ainslie and his British America’s Cup challenger, INEOS TEAM UK, joined at the end of June for the circuit’s Portugese debut, the GC32 Lagos Cup. There they grabbed a podium on the last day. For Copa del Rey MAPFRE, 2015 GC32 Racing Tour champion and catamaran veteran Leigh McMillan took the helm and the British team won. 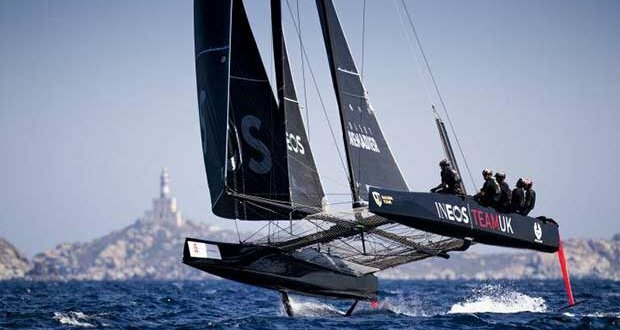 With Ainslie back in charge, INEOS TEAM UK secured another podium third place in Villasimius – a fair result given that this was only Ainslie’s second event helming the nimble, high speed GC32. Some America’s Cup teams have been keeping themselves race-sharp on TP52 monohulls, but they don’t foil, nor do they offer anything like the righting moment of the AC75s. While it may be a catamaran, the GC32 does offer high speed, air-born sailing as the AC75 will. While best known for his singlehanded Olympic dinghies, Ainslie is a past Match Racing World Champion, was tactician aboard Oracle Team USA when they pulled off the biggest turn-around in sporting history to win the 34th America’s Cup in San Francisco. Last year he raced in the 35th America’s Cup Challenger series on an AC50 foiling catamaran in Bermuda under the colours of his own America’s Cup team, which has since become INEOS TEAM UK. On board it is not just Ainslie that is new to the GC32 but his crew – mostly seasoned pros and A-listers, cherry picked from other teams that competed in Bermuda; coming with great AC50 experience, but little or none on the GC32. “We’re just having to learn the nuances of the boat – knowing exactly when you can pop it up on the foils, when you can change modes and make manoeuvres,” says Ainslie. “There is obviously a lot of team work involved and a lot of feel for the boat. We’re just lacking time in it. While the AC50s had all manner of complex hydraulic systems to operate the foils, plus a team of grinders perpetually pumping to keep the hydraulics primed, plus an articulating wing to provide the horsepower, the small and substantially less costly GC32 in comparison is a much simpler boat with a conventional mast and softsails and no hydraulics. You can’t sail it with the same precision, but top speeds approaching 40 knots is still highly respectable from a 32ft boat and having far fewer systems enables the crew to concentrate more on the racing, which is, as Ainslie says, the reason they are competing on the Tour. Given that the existing group of private backers and partners that had got Ainslie’s team to Bermuda would be stretched to cover the increased costs of a campaign for the 36th America’s Cup on a brand new type of boat and in New Zealand, Ratcliffe’s arrival, more as a Larry Ellison/Torbjorn Tornqvist-style private campaign backer, was a game changer for the British challenge. For Ainslie personally he is looking for that one position on the GC32 Racing Tour that has so far eluded him at the GC32 TPM Med Cup, the final event of the 2018 GC32 Racing Tour, coming up in October. But he will have a tough fight on his hands from Franck Cammas and the French crew of NORAUTO, racing in front of a home crown, on home waters.